Before you can measure how risky your online investment portfolio is, you must first calculate its average yearly return. Take your annual returns to measure your portfolio’s average annual return. You can do this easily by taking all your annual returns, calculated using the directions in the earlier sections, and analyzing them. After you calculate your portfolio’s annual returns for each year, you should write them down or put them in a spreadsheet. How do you measure your average return? You can’t just take a simple average by adding up all the returns and dividing by the number of years you have been investing. Doing that will give you the wrong answer. Instead, you must calculate the geometric mean. You can calculate geometric means using a financial calculator or a spreadsheet. 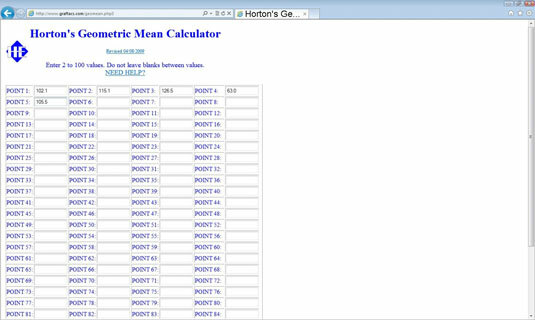 But you can also do it online by using the Horton’s Geometric Mean Calculator. Horton’s Geometric Mean Calculator can’t handle negative numbers. I know you don’t think you’ll ever have a negative return, but just in case, add 100 to each of the returns. Enter those returns into the blanks in Horton’s Geometric Mean Calculator labeled Point 1, Point 2, and so on. After you have entered the returns, scroll to the bottom of the page and click the Submit button. At the top of the page, you see the geometric mean, from which you subtract 100. In this example, the geometric mean is 100.4. You just subtract 100 from 100.4, and you find out your portfolio has a geometric mean return of 0.4 percent. If you used Horton’s Geometric Mean Calculator to measure your portfolio’s average return, you’ve also measured your risk. At the top of the page, right below the geometric mean, is the risk, or standard deviation. Microsoft Excel has a function that measures risk. The STDEV function can measure the standard deviation of returns that you enter. Standard deviation works best as a measure of risk if you have many years of data to study. If you’ve been investing for only a few months or years, you can convert your quarterly results into a yearly number.